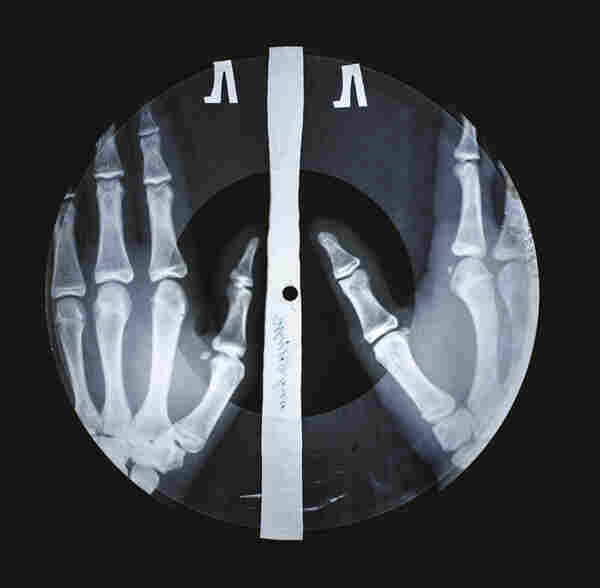 Bones And Grooves: The Weird Secret History Of Soviet X-Ray Music In Cold War Russia, getting your hands on an American rock record was close to impossible. But a few bootleggers found a way to hide their contraband in the last place anyone would think to look. "I thought, 'Is that a record? Or is it an X-ray?' I picked it up, and it seemed to be both," he recounts. "They guy whose stall it was was a bit dismissive — I think he wanted me to buy something else. But I brought it back to London, and I was fascinated by it. 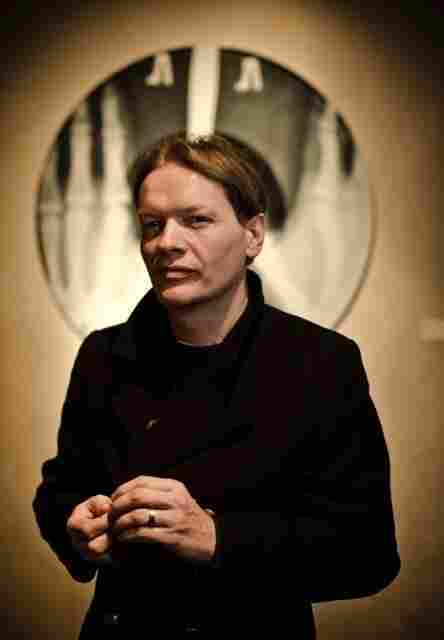 So I started to dig, and that has led me on a very strange journey." Coates is now an obsessive of what is nicknamed "bone music" — makeshift LPs etched into used X-rays, which were playable on a turntable and provided a fitting disguise for their contraband contents. He's collected his findings in a new book called X-Ray Audio: The Strange Story of Soviet Music on the Bone, and he joined NPR's Michel Martin to talk about it. Hear the radio version at the audio link, and read more of their conversation below. Michel Martin: Describe to me what a bone record looks like. Were they cut round, like records are? Stephen Coates: So, they would start off with a square or rectangular X-ray, then probably put a plate on it, draw around it with a pen and cut it out by hand. I mean, often the circumference is quite ragged. How did it occur to you to play the one you found? If I came across a scratched-up X-ray in a flea market, I'm not sure that it would occur to me to play it as a record. Well, the thing is, it looks like a record. If you see these things, they've got a hole in the middle. They've got a groove on them; it's often very faint because it's very shallow. It plays at 78 [RPM] — that was the first thing to find out — and it's only one-sided, as well. I found all these things out by discovery, and went from there. What can you tell us about how they figured out how to do this, and how widespread this practice was? What happened was, it's 1946 or so. The Second World War is over but a much colder war has begun, and in the Soviet Union a lot of culture was subject to a censor, whether it be art, paintings, architecture, film. In St. Petersburg — Leningrad, as it was then — a guy turned up, and he had a war trophy with him. That war trophy was what's called a recording lathe: It's like a gramophone in reverse, a device which you can use to write the grooves of music onto plastic. People who came into his shop observed what he was doing, and, as is the Russian way, they "bootlegged" his machine and made their own machines. It was a bit like dealing or buying drugs, actually. These records were bought and sold on street corners, in dark alleyways, in the park. We did hear a funny thing, which was that if you asked for a particular song — say, "Rock Around the Clock" — and the dealer didn't have it, quite often they would say, "Yeah, I've got that," and they would go in the corner and write "Rock Around the Clock" on one of their other records and give it to you. So there's lots of stories about people buying these records, and they may not have even known what "Rock Around the Clock" sounded like. They'd go home and put it on and it could have been anything, and they were like, "Yeah, that's Bill Haley. He's great!" Listening to some of these, the quality's actually not bad considering how they were made. I mean, they do vary in quality, hugely. Some were virtually unlistenable. But that didn't seem to matter, in some ways. I mean, talking to people who bought these records when they were young — even the tiniest thread of melody, of this forbidden sound, was so exciting. And it led to a different world, really, a world of freedom, [even though the music was] not obviously anti-Soviet. You would think, "Why would that mambo be regarded as something worth forbidding?" I was actually thinking that myself. It opens up all kinds of questions about what people think is dangerous, doesn't it? It really does. And of course, in some [cases] it's obvious: rock 'n' roll, jazz, the music of America, the music of the UK. But with other stuff, it got very strange in the Soviet Union. Latin rhythms — the mambo, the tango — were forbidden because they were seen as being overly sensuous, if you like, encouraging the wrong sort of passions in young people. I mean, the saxophone became forbidden for a while. As a musician yourself, this must have made you think about just how important music is to people, that they would go to such lengths to hear it. For me, the thing that's really poignant is that some of these people went to prison for doing this — they were punished quite severely for it. This was a time when music mattered so much that people would risk public censure, they would risk imprisonment. We live in a time when you can get anything you want immediately. Music is abundant, and that's great, of course. But I wonder, as somebody who makes music, how much does music matter now? Does it matter as much as it used to? This was a time when it mattered immensely, and that's food for thought, for all of us I think.